Meeting Patrice Palacio was like coming face to face with a modern day Gustave Courbet. He is exactly as I would imagine Courbet to be. Down to earth and approachable but somehow innocent and untouched by the harsh world around him. 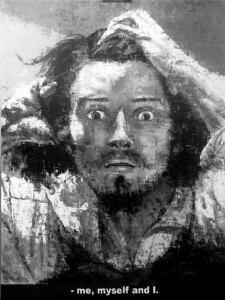 He actually looks quite like Courbet. He seems pure and un compromised, canny and pragmatic in equal measures. “I’m not here to mess around!” He commented, when revealing the scale of his industry as we visited his well stocked ‘atelier’. Patrice Palacio is clearly a proliferate painter. He produces new work on a daily basis, carried away on new ideas, exploring and inventing new techniques such as Fragmental art, the pixel, black and white stills. His genuine sensitivity and awareness of the suffering of others is not only apparent in his work. It’s also obvious when talking to him about the many issues he has highlighted in his painting. From violence against women, to the ravages of gun violence, to the destruction of war,social injustice and religion. He doesn’t shy away from any issue. He admits that he has to choose reading matter carefully as he is so sensitive to what he learns. He could be almost destabilized by the strength of his own feelings. This empathy gives a third dimension to his art. He tackles the themes which inspire him, armed not just with a paint brush and canvas, but also with a huge talent, innovation and open minded candor. From his unassuming demeanor and casual dress, to his sing song Montpellier tones and relaxed attitude, no one walking past Patrice Palacio in the street would imagine that they were crossing paths with an internationally renowned artist. His modesty and practical, organized approach to his work are in opposition to the standard view of the artist. In his spotless studio the large space is immaculately organized to allow for the production and storing of his work. As he removed bubble wrap to reveal the depths of the open brown gaze of a young Troy Davis I was almost shocked by my own reaction. Such strong emotion was apparent in each brush stroke. From painstaking pixilation in… to black and white moonlight reflections captured on canvas on a recent Palavas evening, honesty and effort, a real ‘travail’ of the heart was omnipresent. Months of cutting up volumes and pasting them onto small cubes of wood for his piece on religion, or hours of painting by moonlight. Patrice Palacio is a truly passionate and committed artist, living breathing and working in our own beloved Montpellier. A certain missing piece of the puzzle seemed to fall into place as I discovered his work denouncing domestic violence, protesting about the NRA or exposing injustice in society whilst also honoring the beauty of Manhattan, the poetry of Laurel and Hardy, the talent of Jackson Pollock. We had found the snapshot of American society we needed, to illustrate our approach to French American cultural exchange. Without judgment, without drawing hasty conclusions or inviting comparisons, cultural exchange should be a voyage of mutual discovery. The life of an association is about offering opportunities for living and learning together. Since 1991 we have opened our doors to the people of Montpellier with the aim of creating links and promoting understanding, in the spirit of open minded discovery. I’m delighted to invite you to discover the work of your very own modern day Courbet, on the subject of America. From the eyes of a child of Montpellier, what could be more relevant to celebrate the 25th Anniversary of The French American Center. La « Semaine des 25 ans de l’association French American Center » du mardi 17 au vendredi 20 mai 2016 à la Maison des Relations Internationales. Mardi 17 Mai à 19h00 – Vernissage d’un exposition sur le thème de l’amitié Franco-Américaine. Apéritif et présentation. (Entrée Gratuite). Du Mercredi 18 au Vendredi 20 Mai – Exposition – (Entrée Gratuite) – et permanence pour information de 14h à 17h. Vendredi 20 Mai à 19h00 – Cocktail, Concert et manifestation sur l’histoire de la Musique Populaire, avec musique Live. Entrée 5€ versé entièrement à L’Unicef.